Snapping allows you to create features that connect to each other so your edits are more accurate, with fewer errors. When snapping is turned on, your pointer will jump, or snap to, edges, vertices, and other geometric elements when your pointer is near them and within a certain tolerance. This enables you to position a feature easily in relation to the locations of other features. The Event Editor provides the functionality of snapping to the line, point, and polygon features in the map. Snapping can be useful for the selection of routes, adding line and point events, and creating redlines. In the Edit Events group, click the Snapping Options button . The Snapping Options dialog box appears. The default snapping tolerance is set to 15 pixels. The snapping tolerance is the distance within which the pointer or a feature snaps to another location. If the element being snapped to—such as a vertex or edge—is within the distance you set, the pointer automatically snaps to the location. You set the default snap tolerance value in pixels. Choose one of the layers to snap to from the list of layers available on the map. You can configure Event Editor to support snapping to more than one layer. If your instance supports snapping to more than one layer, check the box next to each layer to which you want to snap. Enabling snapping on multiple layers could impact the performance of your Event Editor instance. Check one or more snap types from vertex, edge, and end snap types. Vertex snapping—The input will be snapped to feature vertices. Edge snapping—The input will be snapped to feature edges. End Snapping—The input will be snapped to feature end points. The snapping options are now set up. To start snapping, click the Enable Snapping button . 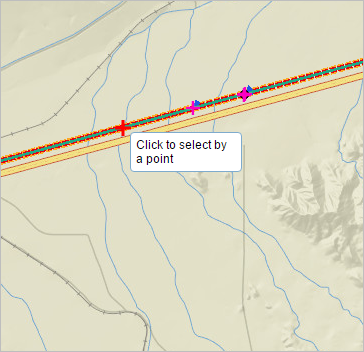 Now, when you move your pointer around the map while using a tool, such as selection of routes, adding line and point events, creating redlines, and so on, the pointer will snap to various geometric locations (shown with a red cross) as you move over them.